Brrr.... 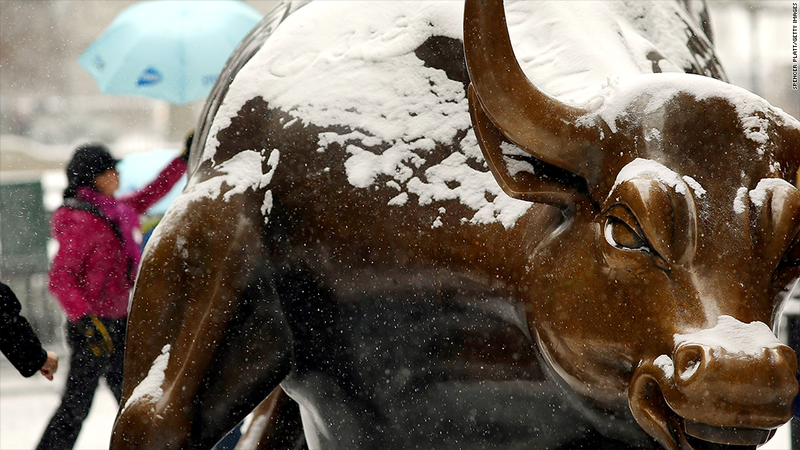 The U.S. economy got off to a chilly start in 2014. Brrr... Go ahead, blame it on the weather. The U.S. economy is not off to a great start in 2014, but it's a little early to call it another bad year. In January, hiring remained tepid, retail sales slowed, auto sales fell and manufacturers reported weak business conditions. Still, some economists are looking at the glass half full and predict 2014 could turn out to be a solid year for the recovery. They're blaming this soft patch on the weather. Job growth is lackluster: After strong hiring in the fall, the economy added a shockingly low 75,000 jobs in December, and then only 113,000 jobs in January, according to a report released by the Labor Department on Friday. "This report validates the weak tone seen in the other economic reports," Credit Suisse economist Jay Feldman said in a note to clients. "The economy seems to have lost momentum around the turn of the year." Economists argue about how exactly blizzards may have affected the report, but generally they agree: hiring should pick up in the spring, or perhaps even sooner. "The hiring trend is likely to revive again in February," said Chris Williamson, chief economist at Markit. Auto sales were weak: After staging a strong comeback in 2013, auto sales suddenly fell 3.1% in January, according to Autodata. Major manufacturers like General Motors (GM) and Ford (F) blamed the slump on the Polar Vortex keeping customers away. "You have to buy milk and bread every week, but people don't go and buy cars when there's five inches of snow," said Bill Hampel, chief economist of the Credit Union National Association. Retailers are hurting: Last week, Walmart (WMT) warned investors that its November through January sales could be weaker than previously expected due to two main factors: the government's reduction in food stamp benefits and winter storms that closed stores. The company plans to lay off 2,300 workers at its Sam's Clubs -- roughly 2% of the workforce at the wholesale club chain. Kohl's (KSS) also warned of weak sales in January, citing "lower traffic and low levels of clearance merchandise." Macy's (M) announced it would close five stores and lay off 2,500 employees. And Target (TGT) is cutting 475 jobs. Even in spite of retail layoffs though, the National Retail Federation's chief economist Jack Kleinhenz believes "the economy is primed for a rebound." Housing recovery is petering out: The housing recovery was an important contributor to economic growth in 2013 but seems to have lost some steam at the end of the year. Home prices are showing signs of topping out, sales of existing homes fell short of expectations in December, and new home construction declined in January. Once again, economists blame this weakness on winter blizzards. If they're right, housing should rebound in the spring. Manufacturing slows: Factories also endured a hit this winter. A government report earlier this week shows factories that produce long-lasting goods like autos, airplanes and appliances saw their orders plunge unexpectedly in December. They also reported their weakest business in eight months, in a separate survey by the Institute for Supply Management. Several of the participants blamed "adverse weather conditions" for the slump. Overall, the outlook is still positive: Bank of America economists Ethan Harris and Michelle Meyer predict the economy will grow at a mere 2% annual rate in the first quarter "in part due to poor weather conditions," but they expect growth to pick up to around a 3.3% rate in March through May. Similarly, Hampel believes the economy's recent weakness is merely temporary. "I don't think we have enough of a change in the underlying fundamentals to say this is a lasting slowdown in the economy," he said. "But that doesn't mean happy days are here again. This is still a disappointing recovery."